Pictures of the 4th Border Regiment who held a large sector of the Somme during a vital stage in the German advance. 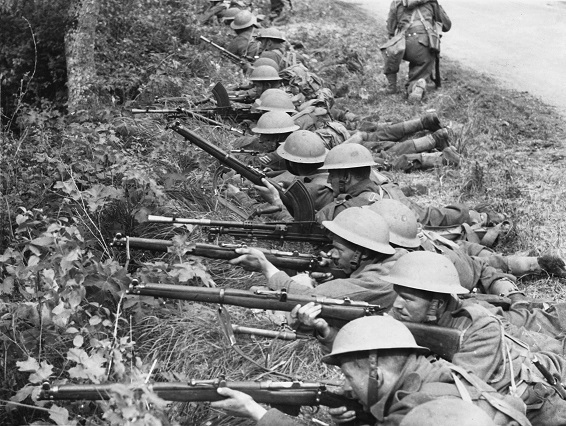 They were an ordinary Infantry Battalion, cut off from the main body of the British Expeditionary Force. They commandeered vehicles and turned themselves into a motorised unit and went for the enemy for five days continuously with great success. Photo shows when moving around the countryside they were surrounded by the enemy and they all took up a defensive position by the roadside. You may have annotations written next to your ancestor’s name. The letter ‘L’ or ‘CL’ and a number or a number on its own refers to another casualty list. This is likely to be when someone who was missing has now been reported as a prisoner or someone who was wounded reported now as having died. The first number in these references will relate to the Casualty List number, found at the start of each daily casualty list. If there is a second number to this code (example: CL 1015/12), this will be the specific page that the previous or subsequent entry can be found. Use the previous/next buttons to move through the documents to view other list numbers.